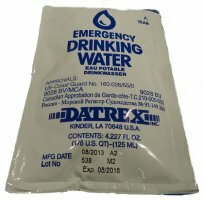 Emergency Drinking Water:4.227 fl. oz. of purified water for immediate use. Pouch Weight: 132g Purified water for immediate use. -Superior packaging materials for optimum durability. -Easy to dispense from a premeasured pouch. -Loss potential minimized due to individual pouches. -USCG, Canadian Coast Guard, EC and NZ approval.